Association pulls through on winter education courses despite home office renovation. Great input from readers on the challenges ahead. Despite a major building renovation at Landscape Ontario’s home office in Milton, Ont., the association’s annual off season training schedule continues to forge ahead at full steam. 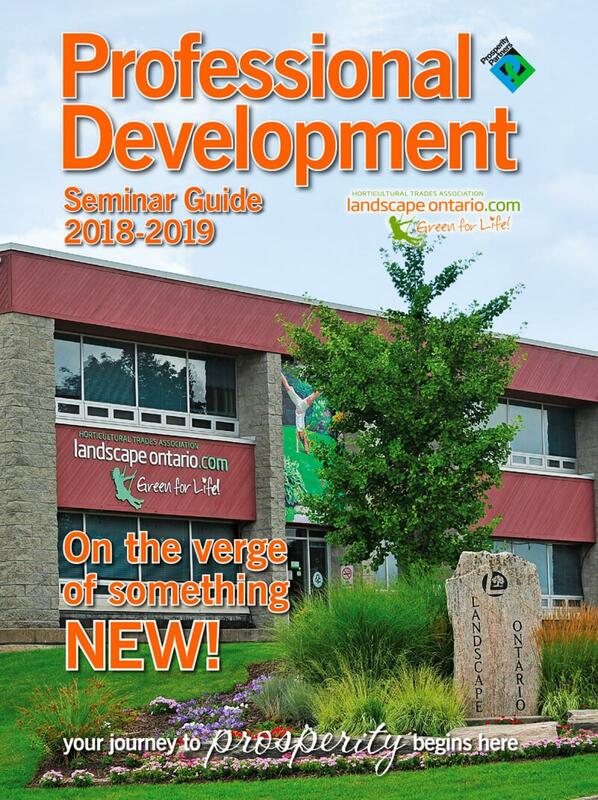 In fact, a copy of LO’s Professional Development Seminar Guide 2018-2019 is polybagged with this issue of Landscape Ontario magazine. The only change this year is that some classroom-based offerings will be held at a select number of hotels in and around Milton. As always, the bulk of practical, hands-on seminars will still be held in the greenhouse at LO’s Milton site. Most are scheduled for early 2019. “The important thing to stress this year is to always double-check the location of your seminar and to follow whatever is listed on the website at HortTrades.com/seminars,” says Kathy McLean, LO Seminar Coordinator. McLean says in addition to the location for every single seminar being listed online, email reminders will also be sent out in advance to each participant that will once again indicate the actual location of the seminar they registered for. Once again this year, LO’s nine regional geographic chapters will also offers a selection of the more popular titles within their own communities across the province. In total, over 80 seminars are being offered across the province, from November through the end of April. The titles offered in the Guide are also aligned with various landscape industry certifications, allowing participants access to material and knowledge that will help them on their journey towards industry certification. For those already certified, seminars also qualify the participant to earn Continuing Education Credits/Units (CECs/CEUs) towards recertification. Seminar titles and content are also aligned in conjunction with other association partners and programs, allowing attendees to earn CECs/CEUs for various programs affiliated with groups such as: International Society of Arboriculture (ISA), accredited Green Roof Professional (GRP), Integrated Pest Management (IPM) accreditation, Fusion Landscape Professional (FLP) program, Water Smart Irrigation Professional (WSIP) program, as well as Red Seal Landscape Horticulturalist, among others. Topics are geared toward all skill levels and positions within the green profession. Some allow participants the opportunity to master technical skills, with others offering tools for business management or owner success. Seminars are offered on: customer service, attracting and retaining new employees, legal obligations, skid steer certification training, irrigation, turf management, stone mansonry, landscape design, grounds maintenance, pruning, plant identification, water gardening and more. A few new titles have been added this year, including Green Roof Design and Installation, and For the ‘Love’ of Vegetables. Seminars are led by experienced leaders within the profession, many whom have long-standing reputations for sharing their knowledge, tips and expertise, including: Nathan Helder, Lorne Haveruk, Jennifer Llewellyn, Beth Edney, Sean James and Rodger Tschanz. In addition to skills upgrading, DiGiovanni says some of the many intangible benefits that come with continuing education include: increased confidence, more efficiency, a safe and happier workplace and a more loyal workforce. Current members of Landscape Ontario and their employees can take advantage of the discounted, individual seminar fee of $137.50, unless noted in the seminar description. Those individuals with landscape industry certification may also qualify for a reduced rate of $125 for select one-day seminars. Some exclusions apply. The non-member rate for most one day seminars is $264. Early bird discounts are also available. Anyone who registers by Dec. 31, 2018 for any seminar held Jan. 1 through April 2019 will automatically receive a 10 per cent discount. Full seminar descriptions and online registration is now available online at HortTrades.com/seminars. On the website, seminars can also be viewed by topic (sector), chapter (location), date or title.